Most people are terrified of speaking in public. Their hearts race, adrenaline pumps through their systems, their hands shake, voices quaver. They’re afraid people won’t like them, that they’ll look or do something foolish, that they will be ridiculed and hence outcast. These fears flow through their minds and their bodies mirror their thoughts. At the networking meetings I attend, the worst part of the meeting for many people is when they have to stand up for thirty seconds and say who they are and what they do. I was no exception. When I first started public speaking, I had all of these symptoms and more. People thought that since I had a background in theater, this would be easy for me. But it made no difference. Acting was playing a character different from myself, and someone else had written all the lines. When I started public speaking, I was myself and the lines were my thoughts and my feelings. I felt totally naked and exposed. “What if they don’t like me?” I thought. “Is my hair okay? Am I wearing the right dress? Will they criticize my ideas? Will they laugh at my jokes or laugh when they’re not supposed to?” The committee in my head was very negative and very loud. It was filled with thoughts of “me—me—me—I—I—I.” No wonder I was a wreck. I hated it. But I kept doing it, knowing that somehow, someday it would get better. My inner senses told me this was a path I must follow, that my future success lay in this direction. I prepared my speeches and practiced. It all changed for me one day when I was scheduled to give a talk to a group of one hundred businesswomen. As I walked to the podium, the familiar litany of criticism and fear sounded in my brain. But as I turned to face the audience, something new happened. I looked out at the sea of faces and connected with a woman in the front row. She was smiling—but the overwhelming impression I had was that she was hopeful. She had come to hear about financial stress reduction—and she needed it. I looked at the woman next to her and felt the same need. Suddenly, I understood. This talk wasn’t about me—it was about them! They had come to hear answers to their pressing financial problems. They thought I might have some solutions to the problems that were plaguing them. They needed this talk and they didn’t care what I looked like or about my dress. They came to hear the message, not to see the messenger. It was a revelation. In that instant, my inner voices quieted and I prayed, “Dear God, please put the words in my mouth that need to be heard tonight that can help somebody.” I got out of my own way, focused on helping others and the words flew from my mouth. I was filled with energy, power and passion. I was connected to the audience and they to me. The speech was over before I knew it. The applause was thunderous. 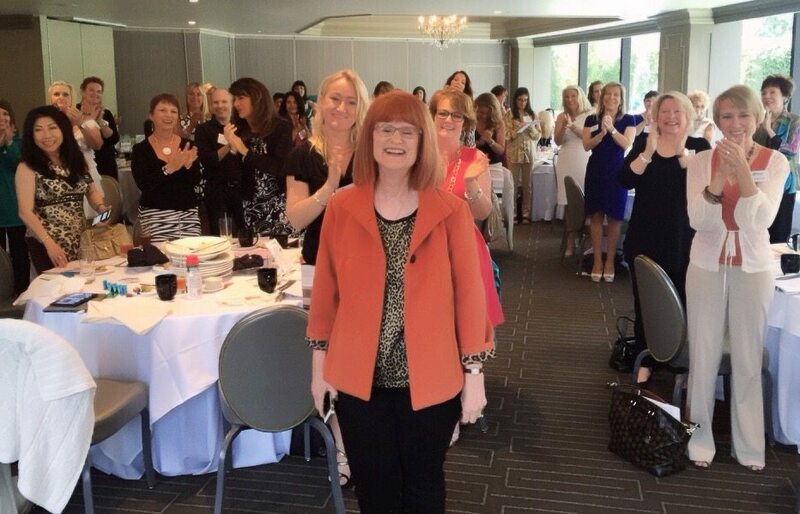 I’ve been a professional speaker for over ten (now 25!) years now. I say that prayer now before every speech. And I haven’t been nervous since. Your only thought when you are working should be how best you can serve other people. It’s not about how you look, how powerful you are, or how much money or acknowledgment you’re getting. What do people need that you have? Your job is to give it to them. Put your attention on your customer, where it belongs. Get your ego out of the way and your fear will leave with it. And then riches will pour into your life. Actually, I say this prayer every day. The more I put my attention on helping people – on their needs instead of mine – the better business I do and the happier I am. A sign I posted near my phone says, “Somebody needs your help.” That’s what drives me to speak, to go network, and then pick up the phone and call someone. Marketing is just holding your hand up and saying this is what I do. If anyone needs this, here I am! Sales is reaching out to someone you think might need your product or service and making it easy for them to find out more about it. In one recent 8-week Financial Stress Reduction teleclass, I was reminding all the participants of the importance of making calls (Gold Calls, not cold calls). “All of you are here in this class because I called you,” I said. “Yeah, but I was already 70% closed on taking this class after I heard you speak,” said one woman. “Really?” I said. “So if I hadn’t called you, would you have called me?” I asked. You see the problem. There are people out there now who have seen you at a networking meeting, met you at a party, heard about your work from a friend, got a referral to you from an associate, read your blog or your book, saw your ad, liked your Facebook page, follows you on Instagram, etc. etc. etc. And they are already 70% closed on working with you! Do you really think you can allay their fears through an endless series of emails? Or texts? Or ads? You need to get really good at making calls. In a call, you can have a conversation, find out their needs, and understand if they would truly benefit from working with you. Then and only then can you coach people past their fears and objections to take action to achieve the life of their dreams. I teach people how to do this in my classes. If you’d like some help with this, let’s have a conversation! Call me at 310-476-1622 and experience my Gold Call style for yourself.